is an amazing and captivating short story. You did an amazing job writing and illustrating this work! 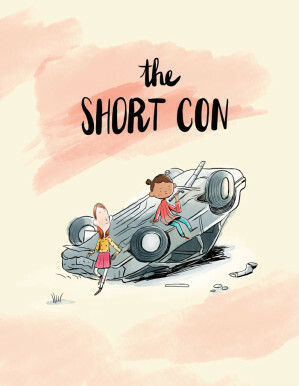 The Short Con is one of my favorite stories I have recently read! I loved all the twists! And an orphanage that is actually a police precinct is an amazing idea. Pops is my favorite character because she’s so head strong and smart! I love the art style and color choices! I’m big into colors and your choices POP! Alek’s style is awesome and cute and illustrative and expressive and makes me feel all warm and happy inside! And Pete’s writing is funny and on-point! I think you guys made a great story together. I hope to see more from you two! Copyright Aleks Sennwald and Pete Toms.